Located in the sought after "Cathedrals" area of Exmouth and within a cul-de-sac is this extended, 4 bedroom detached family home that should be viewed internally to be fully appreciated, This gas centrally heated (except one room) and uPVC double glazed property comprises of an entrance hall, modern fitted cloakroom, extended living room with a fireplace feature, useful study/play room and a high quality, modern fitted kitchen/dining room that has some integrated appliances and granite work surfaces. On the first floor are 4 bedrooms, 3 of which that benefit from built in wardrobes and the master benefiting from an en-suite shower room. There is also a fully tiled, modern fitted family bathroom on the first floor. 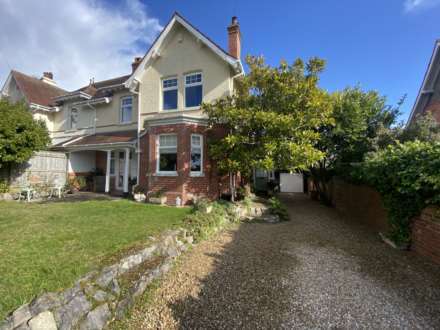 Further benefits to the property include off road parking for 3 vehicles, a single garage and an enclosed and easy to maintain garden to the rear. Obscure glazed window to side. Modern fitted white suite comprising of a low level WC. Wash hand basin. Tiled flooring. Complimentary tiled splash backs to dado height. Window to rear. Laminate flooring. Telephone point. Wall mounted electric heater. Coved ceiling. Walk in, square bay window to front and a further window to front. A high quality fitted kitchen which comprises of a good range of floor standing and wall mounted, cream gloss, cupboard and drawer storage units finished with granite work surfaces and matching up stands above. Built in electric induction hob with a glass splash back and an extractor hood above. Built in, eye level double electric oven and grill. Inset, stainless steel, one and a half bowl sink with a drainer unit to the side and a mixer tap above. Integrated dishwasher and a washing machine. The American style fridge/ freezer, in situ, is included in the sale. Concealed, wall mounted, gas fired boiler. LED lighting to plinths. Under unit lighting. Wine cooler. 2 x Glass fronted display cupboard with lighting. Tiled flooring. Radiator. TV point. Inset ceiling lights. Ample space for a dining table and chairs. Obscure glazed window to side. Modern fitted white suite that comprises of a walk in shower cubicle that has a splash screen door, electric shower unit and tiled splash backs to ceiling height. Low level WC. Pedestal wash hand basin. Heated towel rail. Tiled flooring. Part tiled walls. Shaver socket. Extractor fan. Window to rear. Radiator. Coved ceiling. Built in double wardrobe with mirrored doors. TV point. Window to front. Radiator. Coved ceiling. Built in double wardrobe with mirrored doors. Obscure glazed window to rear. Attractive, fully tiled walls and flooring. Modern fitted white suite comprising of a tiled panelled bath with a central mixer tap, folding splash screen and a thermostatically controlled shower. Low level WC. Pedestal wash hand basin. Heated towel rail. Extractor fan. Inset ceiling lights. To the rear of the property is an enclosed, easy to maintain and relatively private rear garden that is laid to patio, with a shingle border. This area provides the ideal space for outdoor dining and sitting during finer weather. Timber fenced boundaries. Outside lighting. A garden gate to the side of the property leads to a pathway leading to the front of the property and an outside water tap. Further pedestrian access via a gate to the other side of the property leading to the driveway. All main services area connected. Council Tax Band E.
From our prominent Town Centre office, proceed onto Marine Way and into Exeter Road passing through 2 sets of traffic lights before turning right into Hulham Road signposted Ottery St Mary. Proceed over the roundabout and after approximately half a mile, turn right into Dinan Way. Take the 2nd turning left into Bystock Road and then the first left into Hereford Close. Bear left in the cul-de-sac where the property will be found at the bottom of the cul-de-sac, clearly identified by our For Sale sign.